. Limited Edition Pillows . We are happy to announce that This is a Limited Edition (formerly Click for Art), based in England, just revamped their website and released four beautiful Limited Edition pillows of mine! Each design comes in three different sizes. 45cm, 60cm and a 100cm Floor Pillow. However we only produce 250 of each pillow design. These limited edition pillows are made from very soft faux suede with an equally soft luxurious feather inner. The print quality is outstanding! Each is shipped with a sequentially numbered Certificate of Authenticity. The four designs are available now on their shop HERE. Check out an exclusive interview on their blog HERE. 'Manic' limited edition Print Sale. 'Manic' print will be available this coming Saturday! It will be available to purchase on my shop on Saturday 11/8 12:00pm Pacific Time. Our shop site does not calculate individual shipping cost according to your location. Therefore, we will be contacting you individually after the sale to invoice extra shipping costs. The 'Manic' print has a framing option. The prints will be available on my shop. In order to purchase, you must be registered and signed on at the time of sale. Please allow up to 2~5 weeks for delivery. We will do our best for the prints to be delivered in time for Christmas. the first large-scale Hello Kitty museum retrospective in the United States. 40 artists creates work celebrating the iconic character. opening October 11th at Japanese American National Museum in Los Angeles. show runs till April, so dont miss it! also, my pieces and several other works will be available as exclusive prints sold only in-person at the museum. with Tara McPherson and Deedee Cheriel. show runs till August 30th 2014. 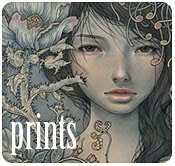 Audrey Kawasaki began her artistic career in her native Los Angeles, after some schooling at Pratt Institute in NY. Moments in the artist’s personal life inform both subject matter and context for her paintings, with strong line work and delicate oils blending seamlessly onto naturally grained wood panels. The artists' newest series of paintings entitled Hirari Hirari, which translates from Japanese as the sound or movement of a petal, leaf or feather slowly falling, is inspired by kimonos given to Kawasaki by her mother and draws from natural motifs such as flowers, birds, and flowing lines found in wind and water. Kawasaki's paintings are comprised of dreamy yet enigmatic portraits of women that exist in moments of tension between idealized innocence and sensuality. The compositions are sometimes melancholic, yet are ultimately resolved in their beauty and balance. A Three Woman show coming up soon! At Merry Karnowsky Gallery. Tara McPherson, Deedee Cheriel, and Audrey Kawasaki. Show runs will August 30th. with your name and +1, +2 etc. Prints will be available on opening night. for more details follow my Facebook, Instagram, Twitter, or Blog. 'Ponderer' print available this coming Tuesday. 8/29.
. Timed Print Sale this Saturday! . The 'Maybe Tomorrow' Print is available this coming Saturday! The sale starts on Saturday 3/15 12am (midnight) Pacific Time and ends after 24 hours. If you order on Saturday 3/15 (within the 24 hours), you will be guaranteed a print! The sale will close on Sunday 3/16 12am (midnight) Pacific Time. The edition size is determined by how many orders were made within the 24 hours. Please allow up to 3~6 weeks for delivery. email us at mail@audrey-kawasaki.com after purchase to arrange. This print has a framing option. A beautiful dark moulding, personally picked out by myself.